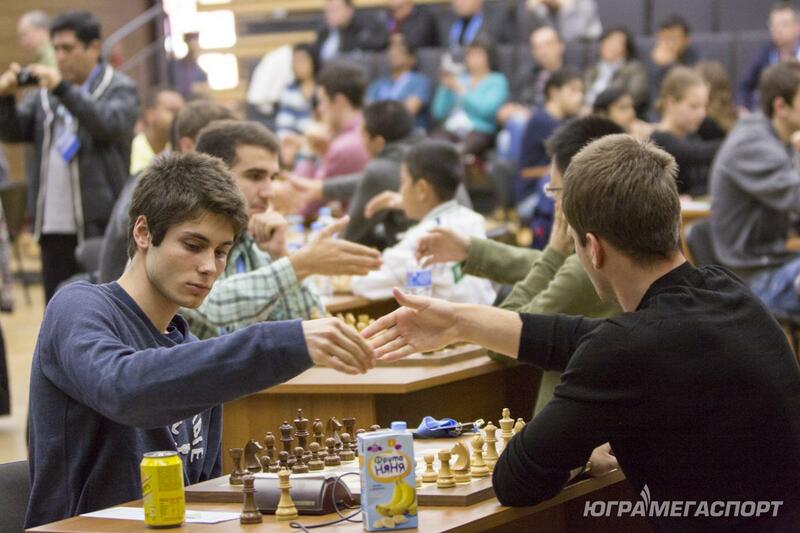 International master Vladimir Barsky prepared a review of the fourth round of the world championship among juniors. In the fourth round of the Russian grandmaster Mikhail Antipov won and overtook the leader Karen Grigoryan, who ended the match in a draw. On the left half of the Board of pawns left, on the right – the structure is almost symmetrical. But no one figure has not yet exchanged, and White thanks to a more active location of his army own initiative. 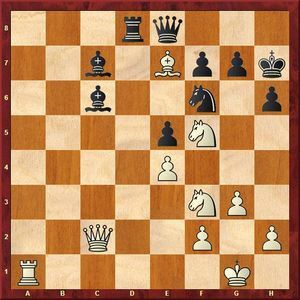 The Knight goes on the shock position and thus indirectly protects his Bishop – 23…Bxc6? 24.Ne7+ Kh7 25.Nxc6 with a double attack for two Rooks. 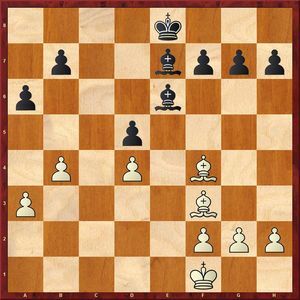 Black was clear, but the elusive path to equality: 24…Bxc6! 25.Bxf6 Nb4 (of course, not 25…gxf6 26.Qc1 Kg8 27.Qxh6 Qf8 28.Qxf6 and White wins) 26.Qc4 gxf6 27.Qxb4, and now no automatic exchange 27…Rxa1 28.Rxa1, and cunning 27…Qf8! Whites are forced to change the Queens, as in the case 28.Qc4 (to give the e4 pawn cannot) 28…Rc5 29.Qb4 Rb8 initiative passes to Black. After 25.Bxd7 Nxc2 26.Bxe8 Rxe8 27.Rxa5 Bxa5 28.Bxf6 gxf6 29.Rd1 (29.Rb1 Nd4!) 29…Rd8 30.Rd5 Bb6 endgame, of course, in favor of Whites, but to win this advantage is likely not enough. Seems to draw in Black was yet complicated: 27…Ra8! 28.Rxa8 Qxa8 29.Bxf6 Bxe4! (29…gxf6?? 30.Qc1) 30.Qxc7 Bxf3, and due to the threat of mate on the first rank with his extra piece, White has to back: 31.Qxe5 (31.Bxe5 Qe4!, bad 32.Ne3? Qb1+ 33.Nf1 Be2) 31…Qb7! 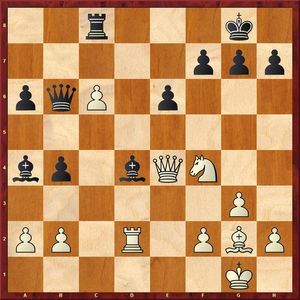 32.Ne3 Qb1+ 33.Nf1 gxf6 34.Qxf6 Bd5 and White cannot untie the Knight. Much harder 28…Ra8 29.Qxe5 Rxa1+ 30.Qxa1 Nh5! (more than 30…Bxf5 31.Bxf6 gxf6 32.Qxf6) 31.N3h4 g6 32.Qd1 Ng7 33.Nxg7 Qxe7 34.Nh5 gxh5 35.Qxh5 Qf6 – White chances to win and Black on a tie are approximately equal. And White have implemented extra quality: 33…Kh7 34.Ra7 Qe1+ 35.Kg2 Qe5 36.Qd3 Qc5 37.Rf7 Qe5 38.Qc4 Qd6 Leads 39.h3 Nd7 40.Ne5 Qe4 41.Ra7 Qf6 42.h4 Qd6 leads 43.h5 Qf6 44.Rc7 Black resigned. The implementation of extra quality doing in this day and rating-favourite of the championship. 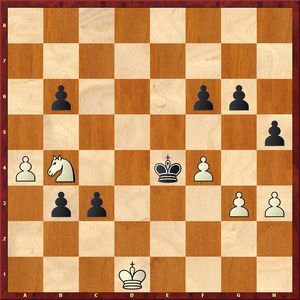 The position arose from Catalan origin: powerful Black Bishop compensates their pawn weaknesses on the Queenside. It’s hard to tell if White has something better than 14.Nxe5 Qxe5 15.Qf3 Qxb2 16.Qxc6+ Bd7 17.Qe4+ Be6 18.Qc6+ with perpetual check or 17.Qc3 with equal end, but after 14.Nbd2? 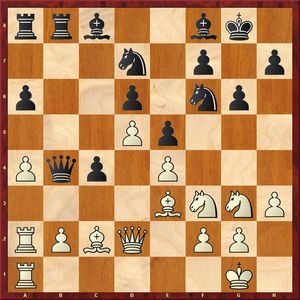 Nxc4 15.Nxc4 Bh3‘ve found that they have to give quality to 16.Qf3, as at 16.Re1 solves double strike 16…Qe4. Of course, there is still a lot of technical difficulties (White is still a pawn for the quality), but Jan-Krzysztof managed to bring the game to victory. The girls after four rounds autocracy – Zhansaya Abdumalik from Kazakhstan took four points out of four. In the system Breuer Spanish party intense battle unfolded on the Queenside. 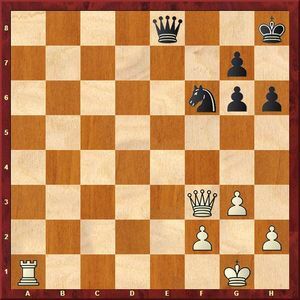 Important move: White capturing the space and have at their disposal square A4. White successfully rebuilt their strength, and now want to tackle the C4 pawn. But Black has its trump cards. Probably perusing the answer of the competitor. 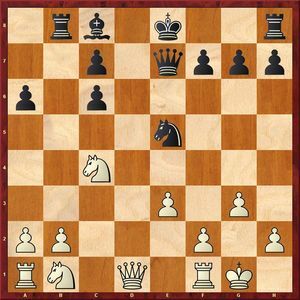 In the case of 28…Nfd7 29.Bxc4 f5 Black would be a good payment: they put pressure on the centre, their figures are quite active, and White are bound by the protection of his extra pawns b2. Not much better and 29…Nxa1 30.Rxb4, for example: 30…Rc7 31.Rxc4 Rxc4 32.Nxc4 Nc2 33.Bb6. 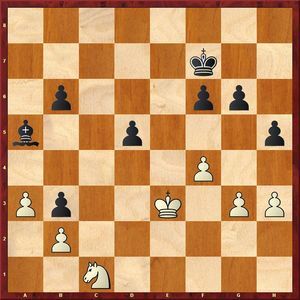 Harder only 29…Rxa4 30.Ra4 Nd4 31.Bxc4 Nd7 32.Rb4 Rc7, although White has a big advantage. 35.a6 Ba8 36.Bb5 Nc5 37.Bxc5 Rxc5 38.Bc6 Black resigned. Alina has faced challenges in the first half of the party, but successfully overcame them, and then received a generous gift. Gift – d5 luxury for your Knight. Black has already lost the advantage, but need to panic: 34…Bf6 35.Nh5 Bxc6 35.Rd6 Qc7 36.Qd3 Qa5 supported approximate equilibrium. Bivol plays artistic. Even stronger was rough 36.Rxd4!, and then the double attack on E7. White has a decisive advantage, but after a few inaccurate moves they almost missed. Very much looks the connection of an Bishop attack – 47.Bf1! 47…Qd6 leads 48.gxf5+ Kf6 49.Ra7? Ought to keep the Bishop on the sight – 49.Rc8! Black play the trap and miss the chance: 50…Qc5! 51.Rxa6 Qxe3+ 52.Qf2 Qc1+ 53.Bf1 (53.Qf1? Bd4+ 54.Kh1 Qxf1#)…Be5 53. Two Bishops in all its glory – it is unclear how White sandy…. The computer already offers a return of quality – 54.Rxc6+, but after 54…Qxc6 55.Qh4+ Kg7 56.Qxb4 Bc7 in the end with multi-coloured Bishops Black needs to make a draw. 51.Qb2+! Bc3 52.Qe2 Bb5 53.Qd2 Qh5 54.Qh6+ Ke5 55.Re7+ Kxf5 56.Bh3#. At first glance it seems that now White restores the material balance, and you can sign the forms. However, Ukrainian chess player finds a beautiful resource to continue the fight. 51…Bc3! 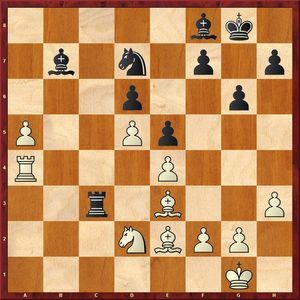 52.Nd3 (it is clear that the Bishop was invulnerable) 52…d4+ 53.Ke2 Ke6! But now the Bishop is not going to go away! 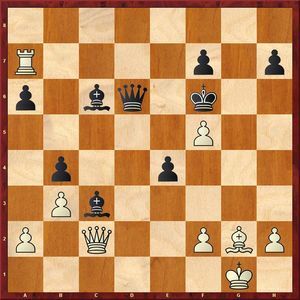 White believed opponent, but in vain: after 54.bxc3 dxc3 55.Kd1 Kf5 56.Nb4 Ke4 57.a4! Black can’t decisively strengthen its position. 2) 57…g5 58.fxg5 fxg5 59.g4! (last exact stroke; in the case 59.Kc1 Kf3 60.Nd5 Kxg3 61.Nxb6 g4 62.hxg4 h4 White lose) 59 60…h4.Kc1 – position draw. Black has the extra pawn, and soon they will take and the second is due to zugzwang. 56.Kd3 b5 57.g4 hxg4 58.hxg4 g5 59.fxg5 fxg5 60.Nd2 Ke5 61.Ne4 Kf4 62.Nd6 Bxa3 63.Nxb5 Bb2 64.Nd6 Kxg4 65.Nc4 Bc3 66.Kh3 Ke4 67.Ne5 g4 68.Kh2 Nd3 69.Nf4 70 g3.Kf3 Bb2 71.Ng2 d3 72.Ne3 d2 73.Nf1+ Kh3 74.Nxd2 75 g2.Ke2 g1Q White resigned. The final snippet shows how important it is to remain vigilant even in the most simple positions. 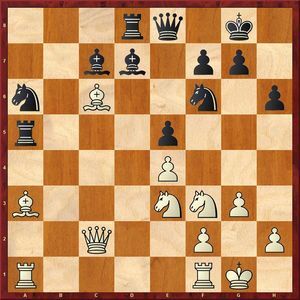 The position is absolutely equal, but after a careless 23.Ke2? g5 White is losing a piece. Алина Бивол vs Лея Гарифуллина. Обзор партии Day 5. Photo moments…unforgetable. WJCC-u20.